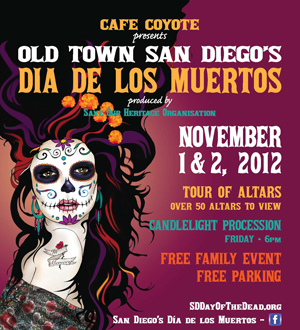 Hey peeps, volunteers are needed for the Old Town San Diego's Dia De los Muertos. Yip, that's in our very own Old Town. This free family event is produced by the Save Our Heritage Organization (SOHO) and presented by Cafe Coyote (cool joint) and it's scheduled for November 1st and 2nd. Docent at one of the altars at one of three locations: Whaley House, Adobe Chapel and El Campo Santo, answering visitors questions and keeping the altar secure. Perform classic or traditional Mexican or Latin American acoustic music. Clean and spruce up El Campo Santo cemetery in the days before the celebration and afterwards. Shifts are only four hours long, and there are six to choose from, so you will have plenty of time to enjoy the event before or after your shift. Please indicate the shift you are available and if you have a preference for job duty (if you are flexible please indicate that as well). And if you are able and willing to work more than 4 hours please let us know! Reserve your volunteer assignment by sending an email to Ashley to ashley.christensen@SOHOsandiego.org or call her at (619) 297-9327 by October 15. 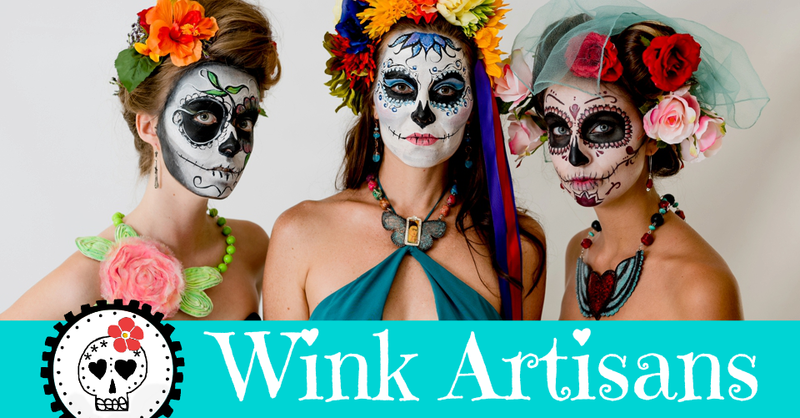 I'll be volunteering on Thursday, who wants to be part of team wink?